Photo courtesy of zimbio.com. 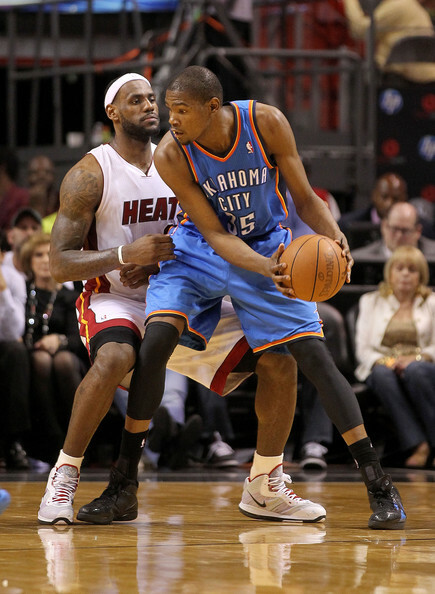 There is no better matchup in the NBA today than LeBron James (left) versus Kevin Durant (right). LeBron James, Kevin Durant, Dwyane Wade, Russell Westbrook, Chris Bosh, and James Harden. Fathom that for a moment. I vote Miami Heat versus Oklahoma City Thunder in the NBA Finals 2012. After watching Wednesday night’s throwdown in South Beach, you would be extremely hard pressed to create a better matchup in the present. Now I am fully aware the Chicago Bulls currently possess the best record in basketball, despite the prolonged absence of their star. But let’s get serious. Unless you are a Chicago Bulls fan, a James/Durant battle over the course of a seven game series would be as good as it gets (yes, even better than James versus Bryant).